Aunt Jane Goudreau, by many accounts, was larger than life and many decades after her death, her presence is still widely felt throughout the northern Great Lakes region. A pipe-smoking storyteller, her story is the story of Michigan, of the Upper Peninsula, of the Straits of Mackinac, and of the Native American and French-Canadian peoples she descended from. In this contribution by writer, genealogist, and ‘Aunt Jane’ relative Theresa Weller, we get to know Aunt Jane and her life on the Straits. Theresa retired to St. Ignace in 2013. She has 30 years experience in genealogy research and is a volunteer researcher with “Genie Girls” a local group dedicated to the area’s family histories. She is also the creator and administrator of the Facebook page Mackinac Area Genealogy and Family History.—ed. “Aunt” Jane Goudreau was born Genevieve Derusha in June of 1865 on the shores of Lake Michigan, at the fishing village of Seul Choix. Her parents were Joseph Derusha and Josephine Lajoie and they were of French Canadian and Native American descent. The Derushas were engaged in fishing and lived for several years at Beaver Island and later settling in Epoufette, another small village near Seul Choix. After Jane grew up, she married Louis Goudreau, the son of the Epoufette patriarch and fisherman, Amable Goudreau. Louis preferred to sail the Great Lakes and earned his captain’s license at a young age. He worked many years for the Arnold Transit Company in St. Ignace. 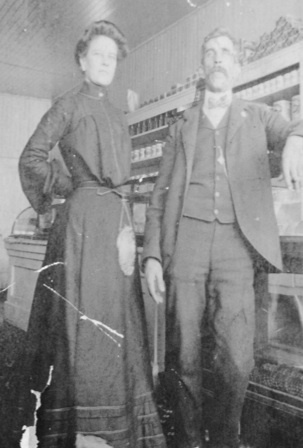 The young couple settled in St. Ignace and became notable individuals in the community. As an adult, Jane was known for many talents including dress making, quilting, gardening, fishing and hunting, and most especially, story-telling. This story is not one of her regional folk tales, but a story about Aunt Jane herself, and her lifelong attachment to a boat. When Jane was a girl living on the north shore of Lake Michigan, there were no roads. Travel to the small village was usually by boat. It must have been a sight to see those white sails on the blue water coming in to the harbor. Excitement throughout the village would have certainly been high wondering what the travelers brought to the isolated community. One such traveler was Captain Henry Bundy from Chicago, a mariner and preacher of the gospel, who sailed with missionary zeal around the Great Lakes on his ship the Glad Tidings. On his first visit to Epoufette, he shared the gospel with the people and gave the children small bibles. One of these small bibles was given to Jane and it became one of her most precious possessions. On the second visit, Captain Bundy, earthy and profane, met Amable Goudreau, a devout Catholic, who had been absent on Bundy’s first visit. Goudreau banned Captain Bundy from future visits, even though the settlement had no priest. Captain Bundy was so successful in his preaching around the Great Lakes he had four different Glad Tidings, each one made larger than the last. His last Glad Tidings was sold to James Keightley, who partnered with George Arnold to form the Arnold Transit Company based in St. Ignace, Michigan. Glad Tidings was refitted by adding 20’ in length and an upper level. She was renamed Elva and put into service. 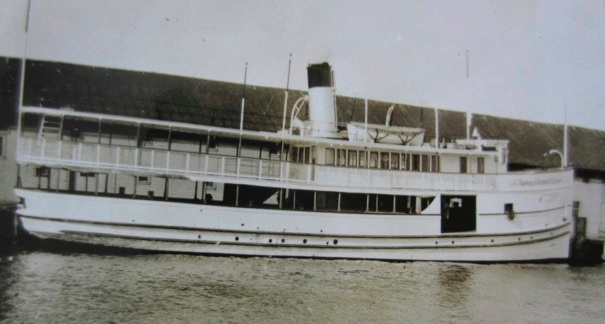 By this time, Aunt Jane was a grown woman and married to Captain Goudreau, who worked for the Arnold Transit Company and, coincidentally, commanded the Elva. 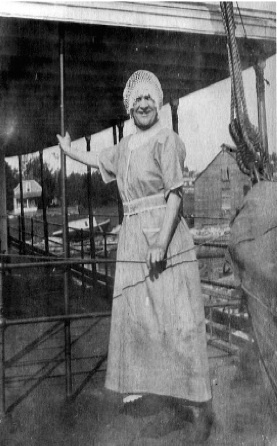 Jane worked for many years alongside her husband on this ship as a cook and hostess. The Captain and Aunt Jane celebrated their 50th wedding anniversary on December 27, 1933, and less than a month later, the captain died. The Goudreaus never had children. Jane was affectionately known to many as “Aunt” Jane. She spent the next decades of her life providing rooms for tourists and maintaining her well-known gardens around her home on Spring Street, known as Manitou. 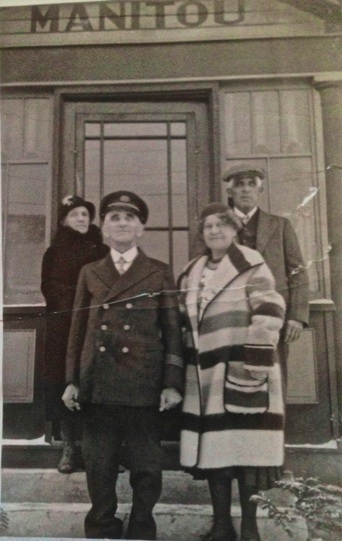 The Captain and Jane (in front), and Louis’ brother Isaac Goudreau and his wife Mary Jane Therrien Goudreau, on the steps of their new home Manitou on Spring Street in St. Ignace, Michigan. One wonders what went through her mind, as she stood there in her kitchen, watching the boat burn. While the ship burned, did she see the story of her life in the flames? For more than 80 years, from her childhood in the 1870s to its twilight in 1954, she had been connected to the Glad Tidings/Elva in one way or another. The time of ferry service from one peninsula to another was over, the end of an exciting and picturesque era.